It's been nearly a decade since the housing market crashed and the Great Recession took hold. Now property values in New York are on the rise, and many foreclosed homes are being auctioned off and re-sold for a profit. But as the I-Team's Chris Glorioso found, those flipped properties are often being remodeled illegally -- and that could put future residents in grave danger. Three quarters of the New York City foreclosures that re-sold for a profit in 2016 were flipped without securing a single construction permit, according to an analysis by the NBC New York I-Team. Investors typically purchase foreclosed homes at auction with the intention of remodeling the properties and re-selling them for a higher price. But data from the NYC Department of Buildings shows that most of the time, developers never bother to file for permits to renovate. "You have every right to rehabilitate your property and to increase your property value, but you should do it the right way," said Ryan Gobin, assistant chief deputy marshal for the NYC Department of Buildings. 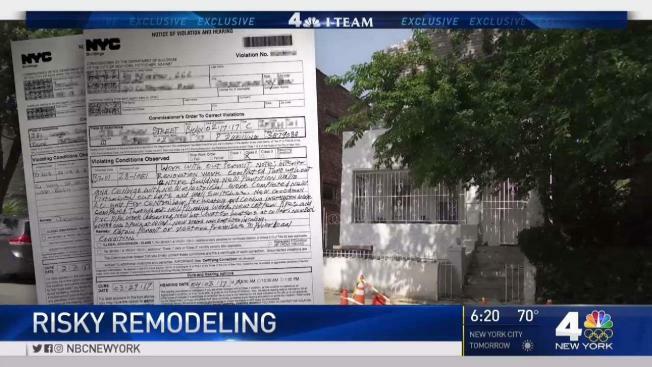 The I-Team found the troubling trend by analyzing data provided by Property Shark, a company that monitors every foreclosure in New York City. Out of more than 900 properties purchased at foreclosure auctions in 2016, 84 of them later re-sold for a higher price on the traditional real estate market. Despite a median price gain of more than $250,000, 63 of 84 flipped foreclosures had no renovation permits on file with the Department of Buildings. Put another way, three out of four flipped foreclosures had no authorization to remodel. A Bronx foreclosure purchased at auction for $235,000 and then re-sold nine months later for $629,000. The city has no construction permits on file. A home in St. Albans, Queens, purchased at auction for $305,000 and resold five months later for $499,000. The city has no construction permits on file. An East New York, Brooklyn, home purchased at auction for $415,000 and resold seven months later for $740,000. The city has no construction permits on file. The I-Team reached out to the investors who flipped each of those homes to ask what accounted for such dramatic price appreciation. None immediately responded. The safety consequences of doing work without obtaining permits can be severe. In 2005, two firefighters died after they were blocked from the fire escape of a burning Bronx building. The building owner had installed illegal partition walls without permits. Tim Hogan, deputy commissioner of enforcement for the NYC Department of Buildings, said illegally subdividing rooms is a common tactic to cram in more renters and make foreclosures more valuable in a hot real estate market. “People will buy a property that they have mortgaged themselves to the hilt and then, in an attempt to try and handle those mortgage payments, they’ll build illegal apartments in the basement so they are able to pay their mortgage payment and keep the house," Hogan said. To try and crack down on illegal renovations inside foreclosures and other investment properties, the Department of Buildings is using data analytics to keep pressure on contractors and owners who have been caught doing unpermitted work in past. In one recent case, the department monitored the activities of a single building owner and found he made illegal conversions to 42 properties before re-selling them. In another case, the Department of Buildings worked with prosecutors to bring criminal charges against a pastor owner who illegally subdivided a building where a resident died, unable to escape a fire. Hogan said those cases should give pause to any investor looking to make a quick buck by illegally renovating a foreclosure. “I don’t think it’s worth it? Is it worth taking the risk to endanger the lives of fellow New Yorkers over a few dollars?" he said.